Kyiv type 2 Trident overprints are the most common of all Tridents; copies can be found in the most basic collections. Partly because of this and partly because there are so many collectible varieties (Bulat 229 - 581), they get neglected. I certainly neglect my stock of them. But suppose you concentrated just on overprints on rouble value stamps? First of all, you would have to improve on Bulat's listing of the basic stamps which is very poor. You need to go to a good catalogue (Michel and Standard, for example) and establish the full range of stamps potentially available for overprinting. They differ in perforation, direction of varnish / chalk (Kreide) lines, shades, printing varieties, and so on. That need not be a main focus of research. The large format of the rouble value stamps makes them a good basis for a postmark collection and the basic stamp used need not interest a postmark collector. 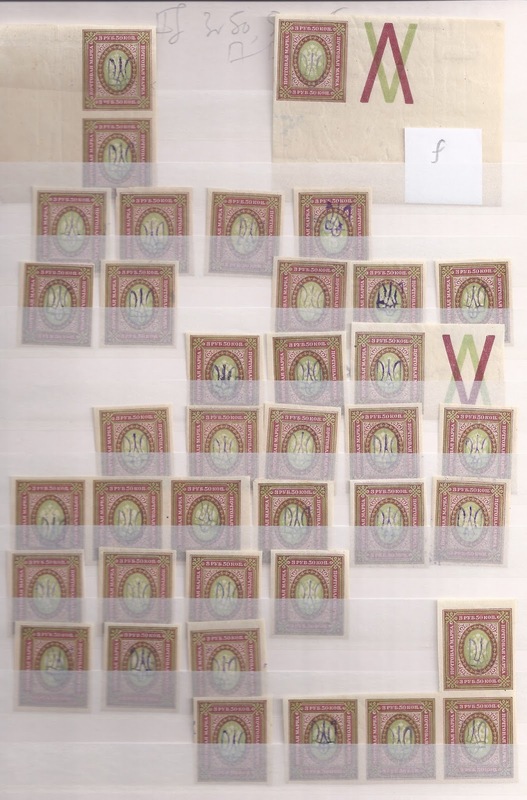 Interestingly, though philatelically-inspired varieties on kopeck values are quite common, philatelic varieties on the rouble values are not common - maybe just because the basic stamps were so expensive. Even inverted overprints are rare - which is extraordinary when you think that every single overprint comes from single handstamps and that millions were overprinted, probably by a small army of post office clerks. What you do find is variation in the shades of ink used in the overprinting process. The majority of stamps are overprinted in an obvious violet, but some are in an obvious blue. Then these two colours are sometimes found in a mixed state, which you would expect if a handstamp is switched from one ink pad to another. In addition, you find violets which are more or less grey. But grey on its own or black are rare or non-existent. Red (or violet mixed with red, or red mixed with violet) does exist on the 1 rouble imperforate overprinted with Kyiv type 2ee (Bulat 404a). I think this is probably a philatelically-inspired variety. Finally, of course, Kyiv 2 Trident overprints on rouble values have to be classified as coming from Handstamp Types a, b or bb, c, d, e? or ee, f, g or gg, a listing which serious work may show needs a bit of revision.